Key Takeaway: U.S. President Donald Trump will likely make concessions but receive nothing meaningful in return during his first bilateral summit with Russian President Vladimir Putin on July 16. The summit itself will boost Putin’s legitimacy at the expense of the West. Any resultant agreement will simply mark an additional victory for Putin. The belief that the U.S. could benefit from a deal with Russia on Syria rests on inaccurate assumptions about Russia’s objectives and capabilities, particularly with regard to Iran in the Middle East. The meeting will likely exacerbate tensions between the U.S. and Europe, and embolden the Kremlin to continue its global campaigns to undermine U.S. interests and influence. Putin is continuing to use the doctrine of “reflexive control” - causing an adversary to choose from options advantageous to his own objectives - to shape the outcome of the summit in advance as analyzed by ISW in 2015. It would be premature to make concessions now to Putin. A summit is not inherently counterproductive but current conditions will grant a disproportionate benefit to Russia. The summit itself represents a significant concession by the U.S. considering the full suite of international sanctions on Russia. The summit boosts Putin’s domestic and international legitimacy at a time when his approval ratings at home are plummeting due to unpopular pension reform. Putin will exploit this short-term gain of credibility through his state-controlled propaganda machine. Putin uses such periodic endorsements of Russia’s global leadership and legitimacy as a great power to feed his disinformation campaigns at home and abroad, including narratives aimed at undermining the West. Recent Russian behavior does not warrant such a concession. The Kremlin has increasingly undermined U.S. interests and violated international law over the past four years, starting with its illegal occupation of the Crimean Peninsula in Ukraine. Limited U.S. and European sanctions may have slowed its ability to pursue these disruptive campaigns. Russia nonetheless continues these activities largely unabated and has not conceded any ground in prominent conflicts such as Ukraine or Syria. Russia should be paying for an opportunity to participate in a summit. The U.S. should have insisted that Russia meet a number of preconditions in exchange for the opportunity to reopen formal dialogue between Trump and Putin. The Kremlin - despite its posturing - would have likely conceded on some points given the importance of the meeting and its fundamentally weak negotiating position with few key leverage points. Putin will likely offer concessions that amount to resolving problems originally created by Russia. This kind of negotiation exemplifies typical reflexive control. The U.S. stands to gain little at the summit. The U.S. will likely cede both its leverage and its national security interests to the Kremlin. Trump might attempt to strike a deal with Putin that includes a withdrawal of the U.S. from Syria. The reported concept would formally cede control of the de-escalation zone in Southern Syria to Russia, guarantee the safe withdrawal of the U.S. from Eastern Syria, and require Russia to contain the influence of Iran in Southern Syria. The U.S. cannot protect its national security interests in Syria by outsourcing the problem to Russia. These interests include preventing the resurgence of ISIS and defeating al Qaeda, the latter of which ISW assesses is strengthening inside of Syria. Russia, Iran, and Assad likely do not possess sufficient capability to neutralize the threat posed by Salafi-Jihadism in Syria. ISIS therefore stands to resurge and reverse its losses after a withdrawal of the U.S. Anti-ISIS Coalition from Syria. Trump’s reported plan to use Russia to curb Iran in Syria also rests on the flawed assumption that Russia is both willing and able to contain Iran. ISW has assessed that the Russo-Iranian Coalition is not an alliance of convenience but rather a strategic partnership based on shared long-term interests beyond Syria. 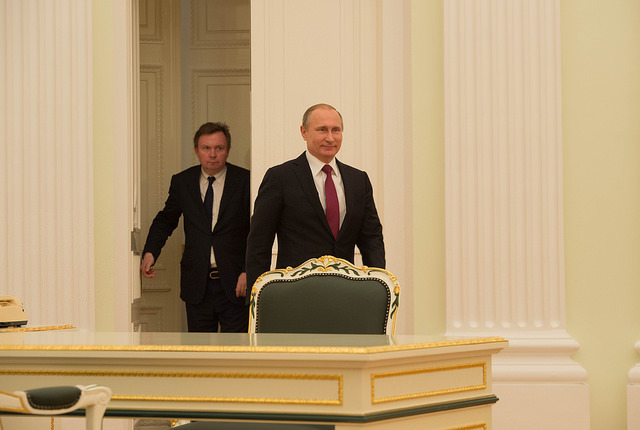 Putin is highly unlikely to deliver on his promises to contain Iran. Russia is still intensifying its campaign to expel the U.S. from Syria. Russia seeks to expel the U.S. from Syria in order to reassert the rule of Syrian President Bashar al-Assad and thereby guarantee long-term basing for Russia in Syria. Putin may seek to capitalize on Trump’s stated preference for an “imminent” withdrawal of the U.S. from Syria. The Russo-Iranian Coalition is building a network of deniable proxy forces to attack the U.S. and its local partner - the Syrian Democratic Forces (SDF) - in Eastern Syria. Russia intends to use this threat to coopt the SDF and delegitimize the presence of the U.S. in Syria. Putin simultaneously circulated false narratives regarding the withdrawal of Russia from Syria in order to shape perceptions ahead of the summit. Putin has previously claimed similar troop withdrawals when his forces conducted regular rotations of military assets. The Kremlin has set conditions to offer control over the de-escalation zone in Southern Syria and restraints on Assad in Eastern Syria as false concessions to the U.S. These terms would support the strategic objectives of the Russo-Iranian Coalition at the expense of the U.S. in Syria. The Kremlin might also attempt to guide the U.S. toward a future counterterrorism partnership that masks its true aim to exclude the U.S. from Syria. Putin will likely attempt to extract critical concessions from the U.S. over time. Putin’s key wish-list for the summit includes removing sanctions, compelling the U.S. to abandon Ukraine and Syria, and curbing NATO’s military buildup in Europe. These potential demands are listed in the chart below. Putin will likely prioritize action on sanctions due to their impact on his ability to wage subversive campaigns abroad and maintain internal stability at home. The U.S. is currently pressuring its allies in Europe to abandon the controversial Nord Stream 2 Pipeline from Russia to Germany. The Trump Administration passed conditional sanctions on Russian aluminum producer Rusal that will have acute economic effects when they take effect around August 2018. The EU also recently agreed to renew sanctions on Russia linked to Crimea and Eastern Ukraine. Putin will seek to compel the U.S. to cease its lobbying against Nord Stream 2 in Europe and halt the imposition of new sanctions against Russia. He may offer the promise of a fictional counterterrorism partnership in Syria as an incentive to Trump. Putin will nonetheless likely forgo these broader demands at the Helsinki Summit in order to avoid resistance from the wider U.S. national security establishment. U.S. National Security Advisor John Bolton notably did not discuss sanctions on Russia during his official visit to Moscow on June 27. Putin instead will use the summit to boost his legitimacy, set conditions for follow-on discussions, and exploit opportunities to drive friction between the U.S. and Europe. Putin will exploit the existing friction between the U.S. and EU over Nord Stream 2 and other sanctions on Russia as well as the withdrawal of the U.S. from the Joint Comprehensive Plan of Action (JCPOA) with Iran. The summit will likely further embolden Russia even as it erodes the unity of the West. Several EU countries are actively resetting relations with Russia. Austrian Prime Minister Sebastian Kurz hosted Putin in order to strengthen bilateral relations in June 2018. Italian Prime Minister Giuseppe Conte is also prioritizing stronger ties with the Kremlin, including a review of EU sanctions on Russia. Putin has sensed this opportunity and met with numerous world leaders in May and June 2018 in a likely effort to court the EU and drive a wedge between the U.S. and Europe. The EU will draw a powerful signal from the summit regardless of its outcome. Russia stands to attract a small but growing number of EU member-states into its orbit, intensifying friction within the EU. NATO may similarly suffer negative consequences from the summit. Trump continued to voice his dissatisfaction with the spending contributions of allied states in NATO ahead of a scheduled July 11-12 NATO Summit. Trump has also criticized the structure of the alliance, prompting the resignation of the U.S. Ambassador to Estonia. The Kremlin still considers its top global adversary to be the U.S. and NATO. Putin’s objectives remain focused on preserving his regime, limiting U.S. global hegemony, and expanding the sphere of influence of Russia. His supporting objectives include increasing friction between the U.S. and EU, fracturing NATO, regaining full political control over Ukraine, and expanding Russia’s footprint in the Middle East. The Helsinki Summit - on its current trajectory - will only help to advance these goals for the Kremlin. 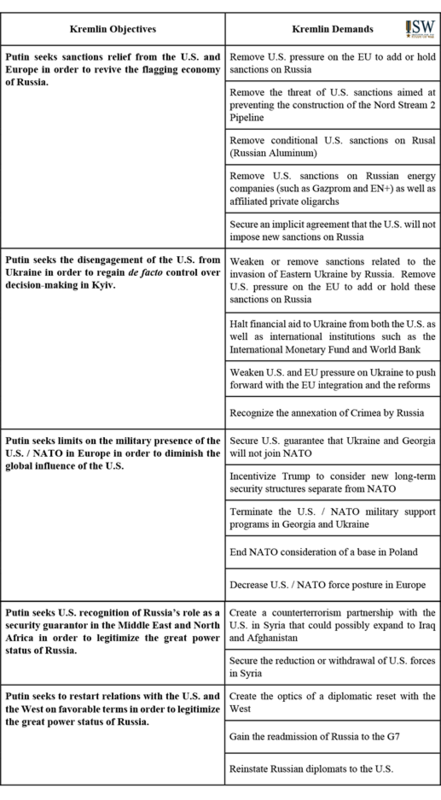 The chart below shows the set of long-term demands that the Kremlin may seek to ultimately negotiate with U.S. President Donald Trump. Putin is unlikely to focus on these demands during the summit but rather set conditions for follow-on engagements. View an enlarged version of this chart here.